Boxing Announcer: Welcome one and all. I know a lot of you have been anticipating this for a while now, and I am so happy to be here to witness what could be an historic event. We have a newcomer on the scene here for his first fight. 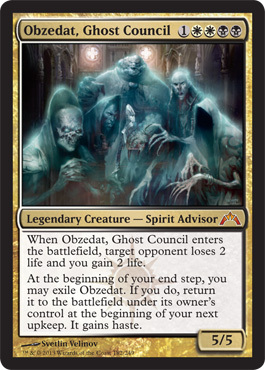 Before today, he has been relatively unknown in the boxing community here in Ravnica. We’ve been keeping an eye on this competitor for a while. Some spectators will be surprised by the results of the tournament tonight. There have been some concerns about multiple personality disorder, but his trainers assured us this would not be an issue in the fight. We caught up with the fighter for a little chat, down to you Detainia. Detania: Azorius Reporter Detainia Forcast on the scene here live before the big fight. I have with me the fighter in the spotlight tonight, Big-O. Thanks so much for meeting with me tonight Mr. O, it’s a true honor to have someone of your rising stardom on the show. You must be so excited to get your shot here tonight. Big-O: Yes. I am pleased these competitors were willing to step into the ring with me today and did not cower in fear. 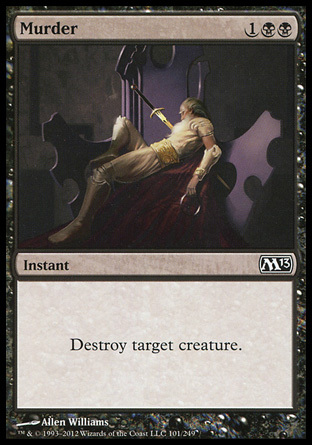 I just want to make Ravnica the best place it can be and if taking down some punks for my guild the Orzhov will help that, I am ready to go at it. 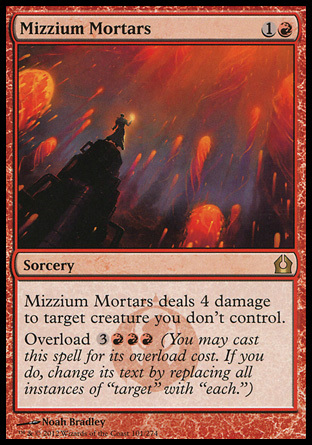 Tonight, I will prove to all of Ravnica that we are not the corrupt organization that many in the city think we are. Detania: Some bold claims tonight from Big-O. Send your thoughts to the Azorius Senate for review (comments section below). Good luck to all competitors! Detania: Who will survive here tonight? Will it be Big-O? Or will another competitor emerge to steal the spotlight? After all, no fighters are hexproof anymore. Am I right? Boxing Announcer: LET’S GET READY TO RUMBLE!! Good evening and welcome to tonight’s boxing match which promises to be a classic in every sense of the word. In the Black and White Corner, we have Big-O, a newcomer on the scene some say will dominate the Standard boxing world for quite sometime. 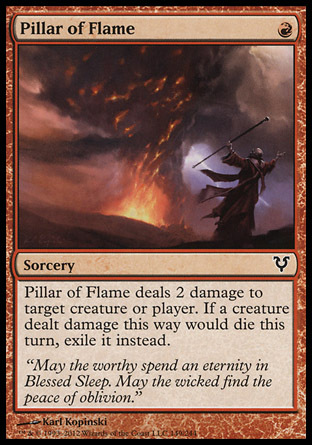 In the Removal Corner for Round one, we have The Flaming Pillar. Pillar has been removing competitors from the ring regularly for two seasons now and is no stranger to a fight. Some say Pillar won’t be able to singe Big-O at all. What will happen? Let’s find out! Boxing Announcer: Well folks, that was a short fight. Pillar came out early, but in the end could not do enough damage to take out Big-O. Round 2 will be starting soon. Big-O said he is ready for another fight. For the second round, he will be up against a bigger opponent this time, but still many say it won’t be enough. In the Removal Corner, we have S.S. Pear. S.S. has had his ups and downs recently. Some have doubted his power and others have never let their support falter. Here we go for round 2! Boxing Announcer: S.S. Pear came out almost as fast as Pillar but in the end, it was the same result. S.S. just could not do enough damage to take out Big-O. He even looks like he regained all of his health, amazing. We have never seen a fighter like this before folks. Big-O says he’s not leaving the ring until he finds a worthy opponent tonight. Let’s see who’s up for round 3. The crowd goes silent as a hooded figure glides through the air towards the ring. Boxing Announcer: I’ll tell you folks, this next competitor surged onto the scene just a few months ago now, but many think he will be around for quite a while. 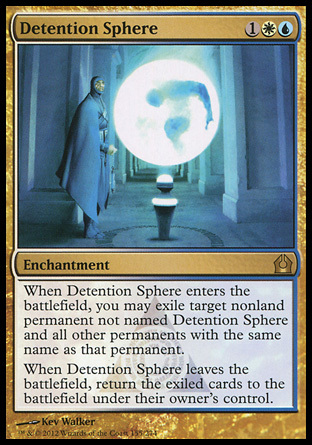 He goes by the name The Ultimate Sphere and he’s been sending his enemies to exile, that’s how good he is. Big-O hopes to change that here tonight. Boxing Announcer: Amazing! The Ultimate Sphere went for his signature exiling move, but Big-O just disappeared and avoided the move altogether! I’ve never seen anything like this! Can Big-O be stopped? He’s still in the ring waiting for his round four opponent The Verdict to arrive. A little backround while we’re waiting folks, both The Ultimate Sphere and The Verdict are from the Azorius Boxing Academy. They have trained together for years and often travel to events together. So, I’m sure that The Verdict will be looking for some revenge for what Big-O did to his friend. Alright! Both corners are filled for round 4! Boxing Announcer: As you can tell folks, The Verdict’s moves look similar to that of his training partner, but will his variation be enough? Some have speculated that The Verdict will be able to overpower Big-O based on the speculation that Big-O has multiple personalities. 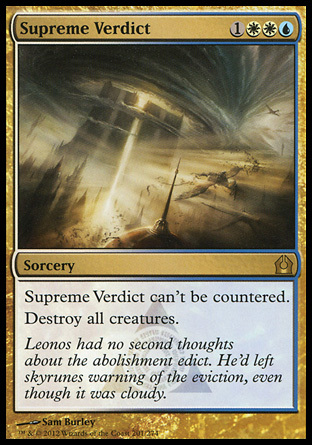 The Verdict has been known to take on multiple opponents at once. That does not look to be enough in this fight however as Big-O takes him down. We have one more round for you tonight, folks. Round 5 will feature, that’s right, The Miz! The Miz had a lot of hype surrounding him initially, but many say he is not living up to his full potential. Will tonight be the turning point in The Miz’s carreer? Boxing Announcer: Like so many of our other competitors tonight, The Miz gets out early, but that doesn’t not seem to be phasing Big-O. He sticks with it though, and trys to win the fight his way. Wait, what’s this? I’ve heard about this folks but not many people have gotten to see it. The Miz is up on top of the ropes, what is this, wrestling? Here he goes! Boxing Announcer: Wow! That was some finishing move. The entire ring is filled with smoke after that one. Surely, Big-O cannot withstand the legendary Overload attack from The Miz. The smoke is clearing so we’ll find out in a moment. Oh my! There he is still standing! Big-O!!! Amazing! Big-O: Ahhhh! Is there no one who can challenge me!?! No One?! Boxing Announcer: It seems like after five rounds, Big-O has not had enough yet. What an event! He has now challenged the crowd here tonight folks. This boxing tournament has turned into quite the spectacle. How can anyone accept Big-O’s challenge after they have seen what happened though? Wait. What’s that? Someone is coming down the isle from the back row! Who is it? I don’t believe this folks! That is El Homicida from the 2013 clan. He was sulking in the back row there this whole time! El Homicida has some unique strengths that may actually help him in this match. It looks like our competitors are ready to go. Boxing Announcer: Well, this seems to be just like all the other fights tonight folks and not a surprise after all. El Homicida comes out early like all the others and then Big-O moves so fast he looks to have vanished. What comes next is Big-O finishing them off. Wait. Wait. It looks like this is just what El Homicida was expecting! Right when Big-O returns El Homicida stuck him right in the back! That jab almost looked like a knife! It was so fast and pin-point accurate! Oh My! Big-O goes down! He calls out a challenge to the crowd and that challenger actually takes him down! This has been a great night folks. Azorius Reporter Detainia Forcast is with El Homicida now for the post fight interview. Detania. Detainia: Thank you. Mr. El Homicida, what a surprise to see you here tonight. Were you expecting something like this to happen? El Homicida: Yes actually. I was looking at the information on the fights tonight and it was clear to me that none of these competitors would be able to take out Big-O, but I, El Homicida, knew that he was not invincible. I knew I could defeat him. Detainia: Amazing. How did you prepare yourself for this fight you knew would happen? El Homicida: Well, Detania, ever since I joined the 2013 clan, I have just been waiting for my time to shine. I feel like I have some unique qualities that no other fighter has and now people may finally give me the credit I deserve. Detainia: I think they will El Homicida. Great fight tonight, and good luck to you in the future. Boxing Announcer: Before we go, I wanted to share some information about Big-O’s previous and future matches. Take a look at his history for more insight. 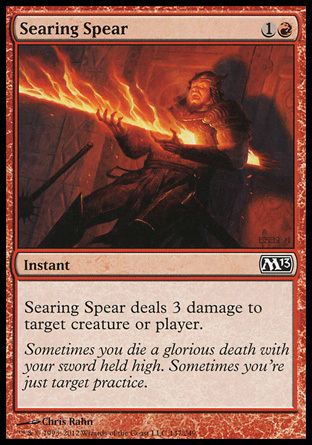 Sorcery speed removal doesnt work on him because he is removed from the game during their turn. Ok lol. thanks for clearing that up. I overlooked the fact that he is only on the board for your turns. Politica di AAP: cavalcare l’onda popolare per compiacere peopleLost di sabotaggio interno e la campagna AAP falso: gli amministratori SheilaServing EnergyEssar lavoro ‘indipendente’ di RuiasEssar Energia piccoli azionisti sono stati irritato dalle Ruias tagliare offerta di prezzo, ma che non la storia: il rifiuto dell’offerta da parte comitato indipendente è.